It's been a while since we've shared with you all a Knickernappies Sighting post. 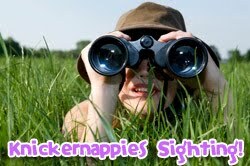 This time around we've got some great opportunities for you to win Knickernappies cloth diapers! For great sales and other announcements from our Knickernappies Retailers please visit our FaceBook Page Wall and check out all our retailers posts and links.